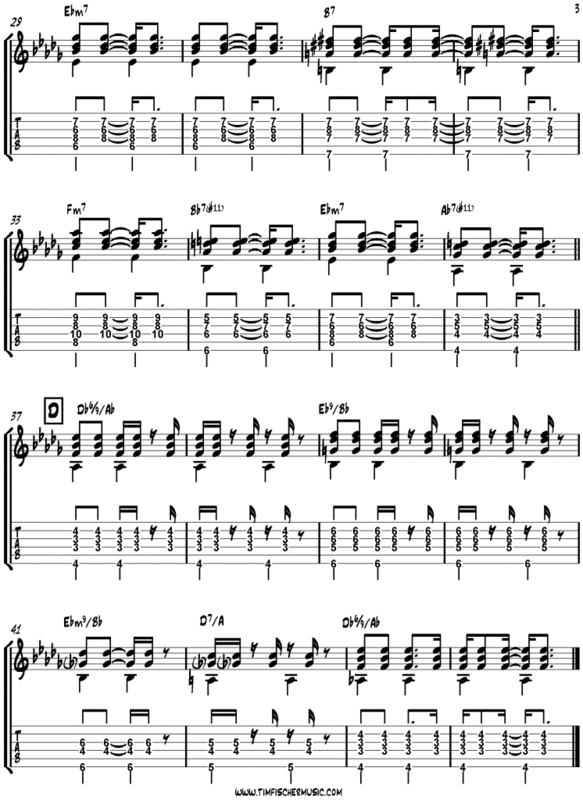 One of the most performed songs in history, “The Girl from Ipanema” is many a guitarist’s introduction to the world of bossa nova. 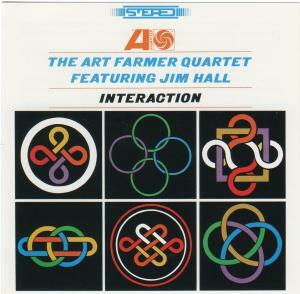 The Brazilian bossa nova style fused jazz-like harmonies with samba rhythms performed on the nylon string guitar. “The Girl From Ipanema,” like so many of the early important bossa nova compositions, is from the pen of Antonio Carlos Jobim. Jobim’s compositional talents rest in his ability to produce singable melodies against colorful and chromatic harmonies (the B section of “Ipanema” is a great demonstration of this concept). 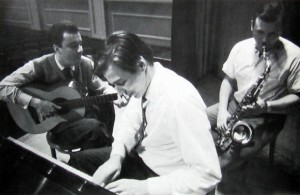 But it wasn’t until Jobim’s compositions were paired with the guitar and voice of Gilberto that bossa nova was fully formed. Gilberto’s debut LP Chega de Saudade (1959) is often credited as the first bossa nova album and features a beautiful recording of the title track, composed and arranged by Jobim. 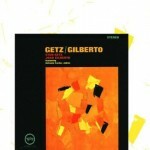 And so, in 1964, Getz/Gilberto was released in the United States and won a Grammy award for Best Album of the Year. The “The Girl from Ipanema” opens with Gilberto singing the Portuguese lyrics, before an English translation is sung by Gilberto’s wife Astrud. 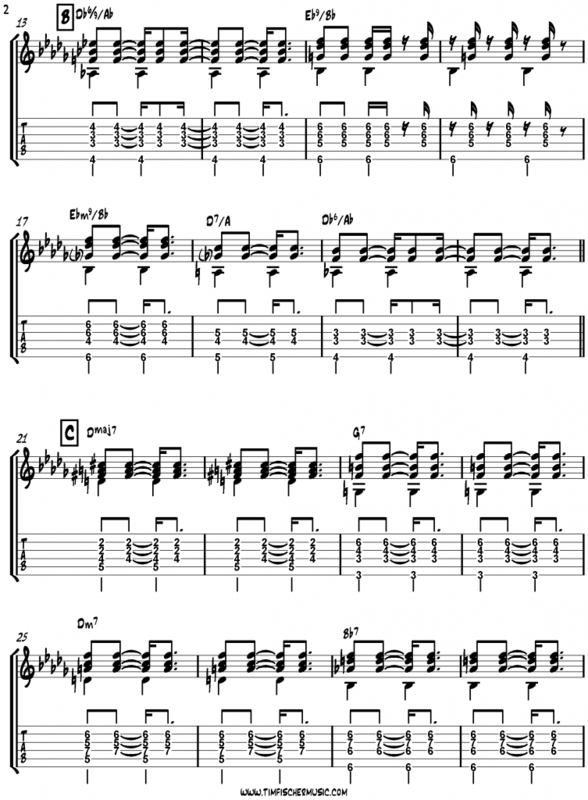 The rhythm guitar transcription provided below is Gilberto’s accompaniment on the first chorus, sung in Portuguese. The recording of “Girl from Ipanema” is in the key of D♭ major, as opposed to the key of F major that is found in the Real Book. Gilberto’s voicings for the A sections contain the fifth of each chord played on the low E string. As Castro-Neves mentioned, Gilberto performs fingerstyle, separating the rhythms of the thumb from the index, middle, and ring fingers. Brazilians feel the bossa nova in two, with the bass/thumb function providing a steady anchor on each downbeat. Gilberto starts his accompaniment with a four-bar introduction that features a repeating one-bar rhythm pattern. This one-bar pattern is varied by occasionally anticipating the first attack by a sixteenth note in the previous measure. 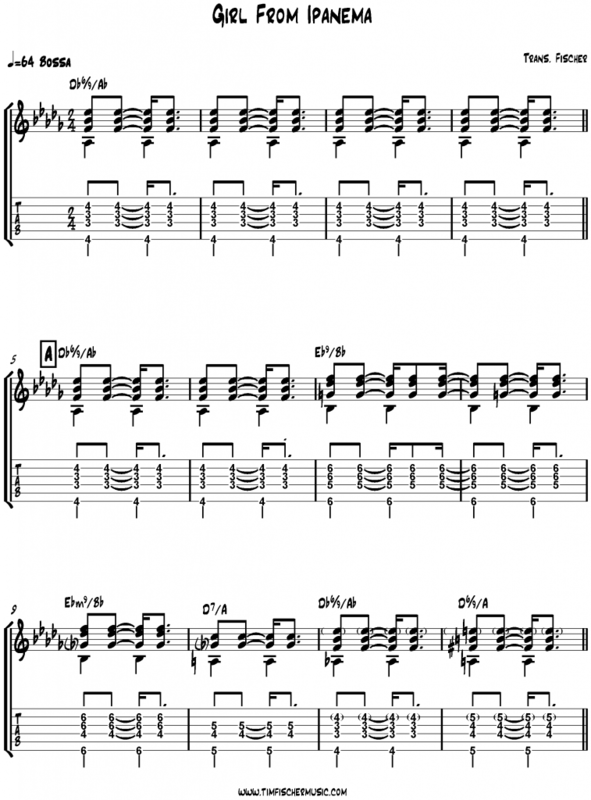 As the song progresses, Gilberto begins to use two-bar rhythm patterns. The first instance occurs on the second A section and acts more as a temporary rhythm “fill” than a new accompaniment pattern. 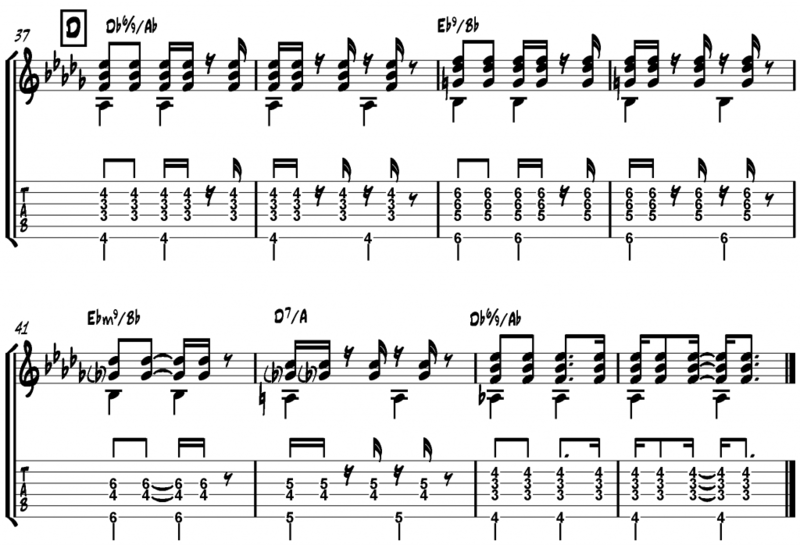 Gilberto ramps up the rhythmic interest during the last A section, using two different two-bar patterns that are more active compare to the basic one-bar pattern at the beginning of the song. When listening to the recording, pay particular attention to short vs long chord durations, as well as accenting of chords and relative volume levels of parts. For more information on bossa nova and other Brazilian guitar styles, I highly recommend The Brazilian Guitar Book by Nelson Faria. Drop 2 and drop 3 voicings are an integral component in developing harmonic flexibility on the guitar.